NEW DELHI: Following Argentina’s 1-1 draw against Iceland in their opening fixture of the 2018 FIFA World Cup, football legend Diego Maradona has cautioned his team ahead of their second tie against Croatia. Argentina are rallying around captain Lionel Messi as the South American giants prepare for their crucial Group D clash on Thursday. Croatia may have secured a vital three points in their 2-0 win against Nigeria in their opening game, but their mood can hardly be described as euphoric. They came into the tournament under a cloud, with captain Luka Modric charged with perjury in a corruption scandal which has rocked Croatian football. Maradona, however, writing in his column for TOI on Thursday, mentioned that despite the off-field problems surrounding Croatia, Arentina will have to come out better prepared. “You need better planning and an improved performance to beat a pedigree team like Croatia. It will be a different game because Croatia will not camp around the penalty box. They have creativity in the midfield in Luka Modric and Ivan Rakitic, who are experts at controlling the flow of play,” Maradona wrote. Maradona called the Iceland result a “disgrace” and warned coach Jorge Sampaoli he would not be able to return to Argentina with similar performances. Adding to the sense of disappointment, Messi’s missed penalty was accompanied by 11 unsuccessful shots, the most in a World Cup game without return by a single player since Italy’s Luigi Riva in 1970. “I said before Argentina’s opening match that Iceland wouldn’t be easy opponents. The debutants were expected to defend with all their might and they did. But I was still expecting Leo Messi & Co to pull it off. If you want the trophy, you should be able to break this kind of resistance. It was disappointing to see their performance,” Maradona added. Despite the solitary point against Iceland, Argentina can take solace from a performance which saw them muster 26 shots and have 72 per cent possession against Iceland. Sampaoli is reportedly considering several changes for the game, including drafting in young forward Cristian Pavon for Angel Di Maria for more creativity up front. 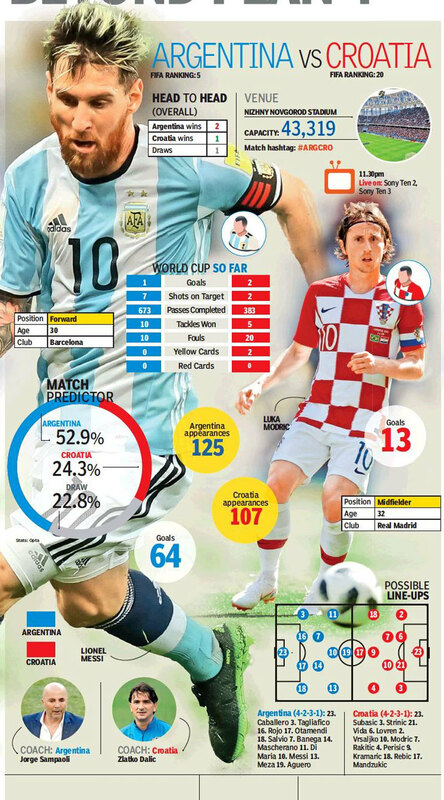 Similarly in midfield, Paris Saint-Germain’s Giovani Lo Celso could start as Argentina seek more attacking options, possibly at the expense of Lucas Biglia. “Our forwards will get more space, since Croatia will not play a completely defensive game. Coach Jorge Sampaoli has to calculate accordingly. Leo and Sergio Aguero are his best scoring options and both will be heavily marked. This opens up space for a third attacker. Di Maria didn’t look good against Iceland. If fielded, he must use the width in the attacking third to create room inside the box. There is talk of Paulo Dybala coming in. I think he should,” Maradona pointed out.